The academic year of 2016/2017 is just about to come to an end, and CAS is looking forward to the next. 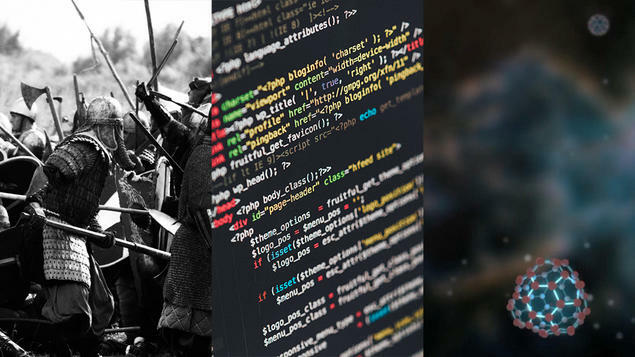 In August, we will welcome three new research groups working on computational linguistics, molecular chemistry, and the Nordic “civil wars”. No doubt next year’s groups will be as versatile as their predecessors. Our language processing capacity is at the core of human intelligence, and the computational investigation of it is an inherently interdisciplinary field. But the research in computational linguistics is often partitioned into either predominantly theoretical or primarily applied perspectives. The research group SynSem wants to re-unite the two perspectives, as well as prepare the field and its researchers for future challenges in the formal, computational, and applied analysis of human language. Read more about the project SynSem: From Form to Meaning – Integrating Linguistics and Computing. Chemistry is the science of matter, but we are mainly familiar with it under conditions that can be realized on Earth. Under the extreme conditions of other parts of the universe, chemistry changes in ways that cannot easily be predicted or understood by our earthly experience. The project Molecules in Extreme Environments aims not only to understand chemistry under extreme pressure and intense laser pulses, as if on a rotating white dwarf or neutron star, but also to guide experimental work. Read more about the project Molecules in Extreme Environments. Between the years 1130 and 1260, “civil wars” raged in the Nordic countries, causing anarchy and chaos. But the research group The Nordic “Civil Wars” hypothesizes that these conflicts were not as chaotic as they have been asserted. The group also suspects that the wars should be regarded as regional conflicts, and not national ones. Engaging political scientists, anthropologists, and medieval historians, they hope to gain a deeper understanding of these wars and how they can be situated in a broader European context. Read more about the project The Nordic “Civil Wars” in the High Middle Ages in a comparative perspective. CAS is honoured to house these scholars and facilitate for the projects, and expect next year to be an exciting one for basic research!